My husband is really quite talented when it comes to making soup. Maybe it comes from living in Scotland where even on a nice day the wind somehow has the power to cut through whatever layers you are wearing and chills you to your core. Then again, maybe it’s just because the man loves to cook. Whenever he’s made me a pot of something soupy I’ve been thoroughly impressed and he never follows a recipe, so in this article I’m not going to give you any specific measurements or proportions. I’ll just be providing some really basic instructions for you to turn some chicken breasts and stuff you probably already have in the pantry into a really delicious cold weather treat. If you would like to cut down on calories, a low fat version can be made with milk instead of cream which also comes out very tasty. First dice the chicken and potatoes into bite sized pieces and coarsely chop the onion. The corn that you use for chowder is actually pretty important as it brings a lot of flavor to each bite. We have tried several brands including frozen and we always come back to old faithful Green Giant in a can. 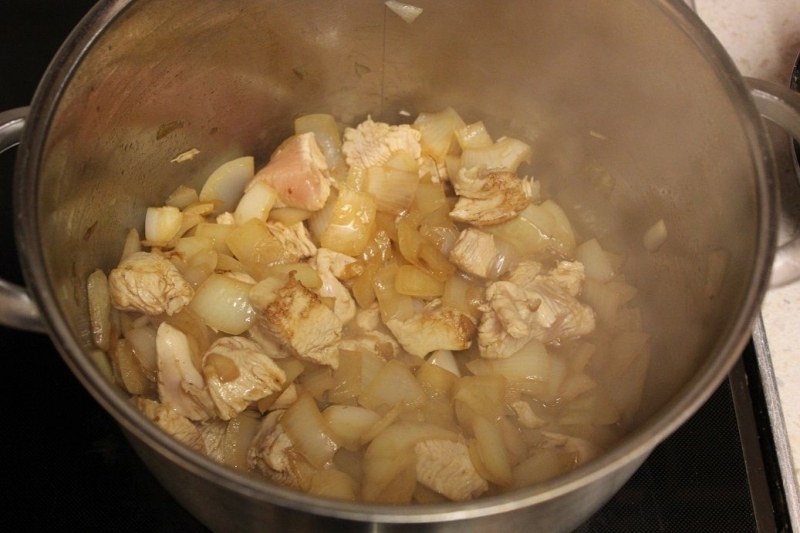 Next fry the chicken and the onion with some butter until the chicken is fairly cooked and the onion is soft. Its not a huge deal to cook the chicken all the way through because it will poach the rest of the way as it boils in the soup. Toss in the stock cubes. 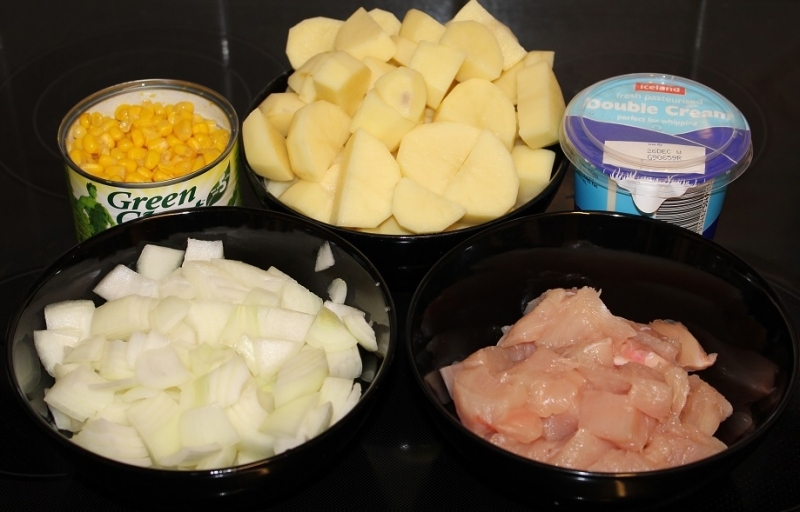 For a large soup pot we used 4 Knorr stock cubes (3 chicken 1 veg). Then add in about a cup of cooking sherry, the potatoes and the corn and fill the rest with water. Let it all boil until the potatoes are soft. Once the potatoes are soft it’s time to add the cream. 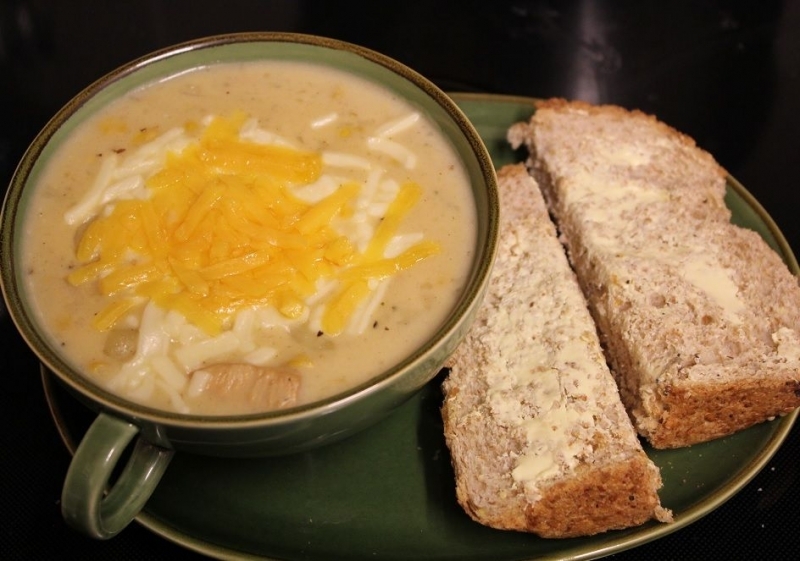 You can just add enough to color the chowder for fewer calories or dump in the whole container for a richer flavor and many more delicious calories. 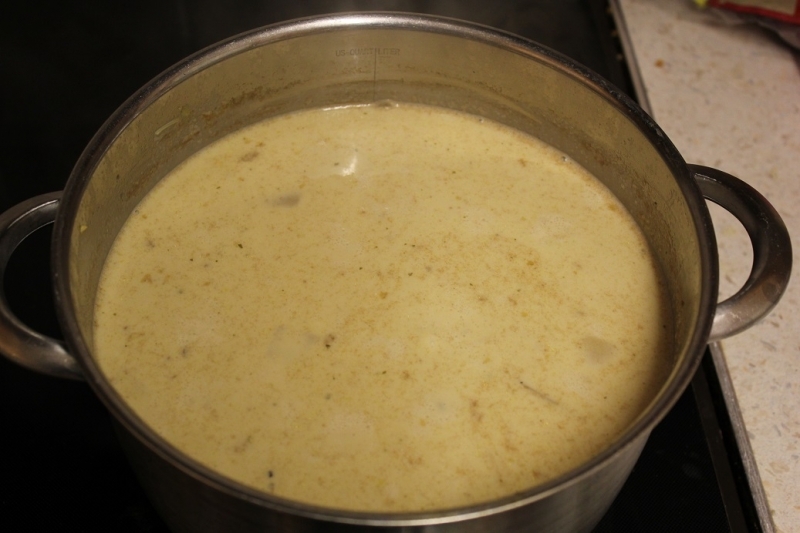 Taste the chowder and season additionally to taste with cracked black pepper. You may also want to add in another stock cube depending on your own preference. Lastly you need to thicken the chowder with corn flour (corn starch). You do this by mixing corn flour into about 1/4 of a cup of cold water until it’s dissolved. You know you’ve added enough corn flour when the mixture coats the back of a spoon. 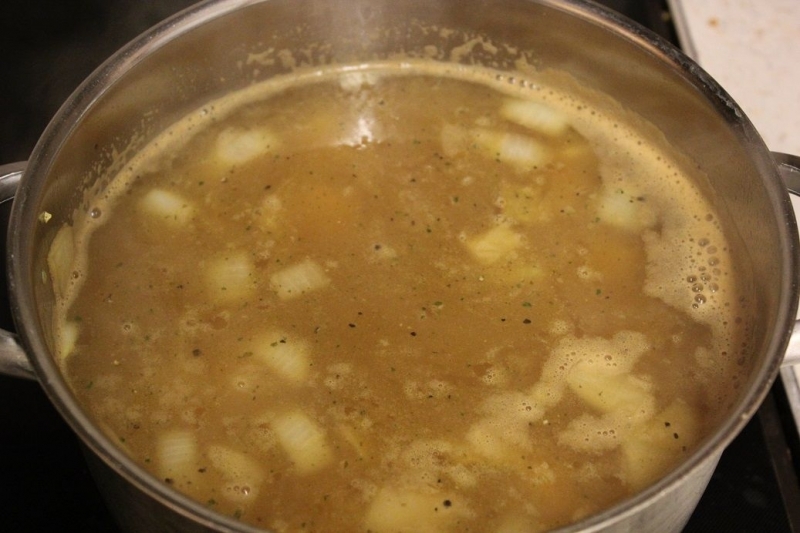 Bring the pot to a boil and slowly pour in the corn flour until the soup has changed from watery to slightly thick. Serve with melted mozzarella and cheddar cheese on top and a side of fresh baked crusty bread.